St Johnstone set up a Scottish Cup fifth round tie against Premier League rivals Dundee United with a comfortable win at Forfar. Kenny Deuchar rose to head the visitors ahead on 23 minutes, powering home a Danny Grainger delivery. Deuchar then crossed for Liam Craig to slide in and convert on the stroke of half time. Craig clipped in a composed second goal after the interval, following a neat through ball from Peter MacDonald. 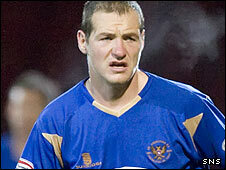 Ross Campbell had the home side's best chance early on but Saints keeper Graeme Smith managed to scramble the striker's effort away. 90:00+0:35 The referee ends the match. 89:48 The ball is crossed by Gary Irvine, Stephen Reynolds takes a shot. Save by Alistair Brown. 86:29 Jody Morris crosses the ball. 85:36 Daniel Grainger produces a cross. 84:48 Murray Davidson takes a shot from inside the box clearing the bar. 84:03 Gavin Swankie delivers the ball, save by Alistair Brown. 83:05 Substitution Murray Davidson on for Liam Craig. 83:05 Substitution Steven Milne goes off and Stephen Reynolds comes on. 82:46 Unfair challenge on David MacKay by Calum Smith results in a free kick. Graeme Smith takes the direct free kick. 80:47 Jody Morris fouled by Nicky Smith, the ref awards a free kick. Graeme Smith takes the free kick. 79:00 A cross is delivered by Daniel Grainger, save by Alistair Brown. 76:58 The assistant referee flags for offside against Steven Milne. Alistair Brown takes the indirect free kick. 75:53 Centre by Gavin Swankie, Andrew Tod makes a clearance. Liam Craig takes a shot. Andrew Tod gets a block in. 74:49 Free kick taken by Graeme Smith. 74:49 Substitution (Forfar) makes a substitution, with Nicky Smith coming on for Kevin Gordon. 74:49 The offside flag is raised against Bryan Deasley. 74:12 Liam Craig is flagged offside by the assistant referee. Alistair Brown takes the indirect free kick. 70:27 Free kick awarded for an unfair challenge on Gavin Swankie by Iain Campbell. Gary Irvine restarts play with the free kick. 69:13 Substitution Calum Smith is brought on as a substitute for Graham Gibson. 66:54 Corner taken by Iain Campbell, Mark McCulloch takes a shot. Blocked by Jody Morris. Corner taken by David Mowat from the right by-line. 66:43 The ball is swung over by Kevin Gordon, Graham Gartland manages to make a clearance. 64:50 Indirect free kick taken by Graeme Smith. 64:50 Substitution Gavin Swankie replaces Peter MacDonald. 64:50 Bryan Deasley is flagged offside by the assistant referee. 64:20 The ball is delivered by Kevin Gordon, save by Graeme Smith. 63:44 Peter MacDonald challenges Ross Campbell unfairly and gives away a free kick. Free kick taken by Iain Campbell. 63:30 Bryan Deasley produces a cross, clearance by David MacKay. 60:54 Free kick awarded for an unfair challenge on Kevin Gordon by Chris Millar. Iain Campbell takes the free kick. 59:50 Substitution Martyn Fotheringham goes off and Bryan Deasley comes on. 58:45 A cross is delivered by Kenny Deuchar, Steven Milne takes a shot. Save by Alistair Brown. 57:01 GOAL - Liam Craig:Forfar 0 - 3 St Johnstone Liam Craig finds the net with a goal from the edge of the penalty area to the bottom right corner of the goal. Forfar 0-3 St Johnstone. 56:23 Foul by Chris Millar on David Mowat, free kick awarded. Martyn Fotheringham takes the direct free kick. 55:18 Chris Millar produces a cross, Peter MacDonald produces a lobbed right-footed shot from 12 yards. Save by Alistair Brown. 53:11 Graham Gartland challenges Christopher Templeman unfairly and gives away a free kick. Direct free kick taken by Iain Campbell. 53:02 Steven Milne sends in a cross, Iain Campbell gets a block in. Correction - 49:49 Free kick awarded for a foul by Peter MacDonald on Mark McCulloch. The free kick is swung in left-footed by Iain Campbell, Graham Gartland manages to make a clearance. 49:49 Free kick awarded for an unfair challenge on Mark McCulloch by Peter MacDonald. 49:19 The ball is delivered by Martyn Fotheringham, Gary Irvine makes a clearance. 48:42 The assistant referee flags for offside against Kenny Deuchar. Free kick taken by Alistair Brown. 47:54 The ball is sent over by Daniel Grainger, Effort from deep inside the area by Kenny Deuchar misses to the right of the target. 47:18 Corner from left by-line taken by Liam Craig. 47:08 Jody Morris sends in a cross, Stephen Tulloch manages to make a clearance. 46:04 Corner taken by Liam Craig, clearance by Andrew Tod. Jody Morris takes a short corner. 45:41 The ball is sent over by David Mowat, save by Graeme Smith. 45:00+0:25 The players leave the pitch at half time. 42:24 Kenny Deuchar provided the assist for the goal. 42:24 GOAL - Liam Craig:Forfar 0 - 2 St Johnstone Liam Craig gets on the score sheet with a goal from the edge of the penalty box to the bottom right corner of the goal. Forfar 0-2 St Johnstone. 41:37 The assistant referee flags for offside against Christopher Templeman. Free kick taken by Graham Gartland. 41:18 The assistant referee flags for offside against Steven Milne. Alistair Brown takes the free kick. 38:53 The ball is swung over by Gary Irvine, Stephen Tulloch gets a block in. 37:45 Free kick awarded for an unfair challenge on David MacKay by Christopher Templeman. Jody Morris takes the direct free kick. 37:07 Shot from just outside the box by Mark McCulloch misses to the left of the goal. 34:30 Corner taken left-footed by Liam Craig from the right by-line to the near post, Stephen Tulloch manages to make a clearance. 33:33 Christopher Templeman produces a left-footed shot from outside the penalty area and misses left. 32:19 Inswinging corner taken by Daniel Grainger, Steven Milne takes a shot. Blocked by Stephen Tulloch. 31:45 The ball is sent over by Liam Craig, Peter MacDonald takes a shot. Alistair Brown makes a save. 31:17 Shot by Andrew Tod from deep inside the penalty area misses to the right of the target. 30:25 Free kick awarded for an unfair challenge on Martyn Fotheringham by Chris Millar. Martyn Fotheringham takes the direct free kick. 29:46 Centre by Gary Irvine, save by Alistair Brown. 29:08 Andrew Tod fouled by Steven Milne, the ref awards a free kick. Alistair Brown restarts play with the free kick. 28:16 Effort by Daniel Grainger from a long way out goes over the crossbar. 26:15 The referee blows for offside. Indirect free kick taken by Iain Campbell. 25:10 The ball is swung over by Peter MacDonald, Andrew Tod makes a clearance. Correction - 22:13 Daniel Grainger provided the assist for the goal. Correction - 22:13 GOAL - Kenny Deuchar:Forfar 0 - 1 St Johnstone Kenny Deuchar finds the net with a headed goal from inside the penalty area. Forfar 0-1 St Johnstone. 22:13 Assist by Daniel Grainger. 22:13 GOAL - Steven Milne:Forfar 0 - 1 St Johnstone Steven Milne grabs a headed goal from inside the area. Forfar 0-1 St Johnstone. 20:20 Liam Craig takes a shot. Andrew Tod gets a block in. Jody Morris decides to take the corner short. 20:04 Steven Milne delivers the ball, Alistair Brown makes a save. 16:52 Free kick awarded for an unfair challenge on Jody Morris by Martyn Fotheringham. Free kick taken by Jody Morris. 12:04 Gary Irvine crosses the ball, David Mowat manages to make a clearance. 11:22 Gary Irvine crosses the ball, clearance by Mark McCulloch. 8:54 Liam Craig takes a inswinging corner from the right by-line played to the near post, clearance made by Stephen Tulloch. 7:40 Corner taken by Iain Campbell from the right by-line, clearance made by David MacKay. 5:58 Inswinging corner taken by Martyn Fotheringham from the left by-line, Andrew Tod takes a shot. Ross Campbell takes a shot. Blocked by Graham Gartland. 5:21 Daniel Grainger sends in a cross, save by Alistair Brown. 2:43 A cross is delivered by Iain Campbell, Chris Millar gets a block in. 1:49 Peter MacDonald challenges Andrew Tod unfairly and gives away a free kick. Alistair Brown restarts play with the free kick. 1:02 Close range headed effort by Steven Milne goes wide of the left-hand post.